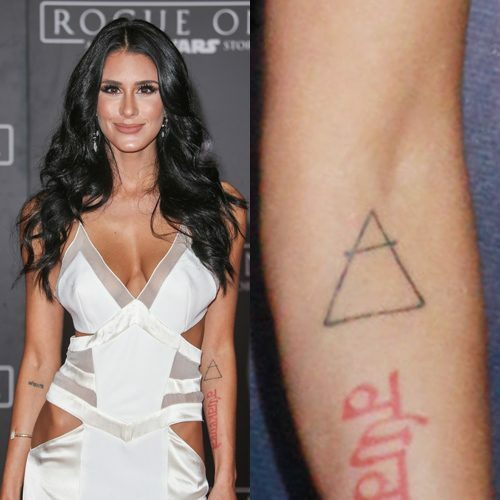 Brittany Furlan has a tattoo with the air symbol on her left forearm. Katy Perry has gotten a tattoo for each of her albums when she’s near the end of her touring cycle. 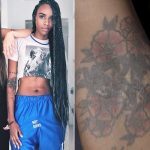 With Witness: The Tour winding down, she finally got her Witness tattoo on August 17, 2018, a few days before the end of the six-continent world tour that started back in September 2017. 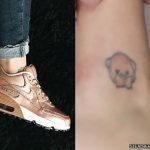 Her previous three tattoos — a strawberry, a peppermint, and a prism — have all been on her ankles and have all had a very similar style, turning symbols from the album into colorful cartoon characters with cutesy eyes. 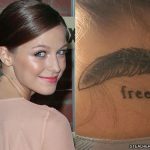 But everything is different with this tattoo: different tattoo artist, different body part, and a completely different design style. 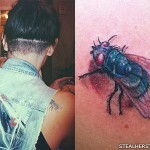 She flew Los Angeles-based artist Dr Woo out to Sydney Australia to tattoo herself and many members of her crew. 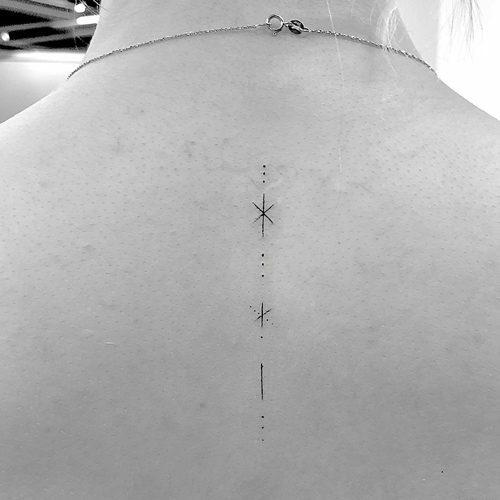 He is known for his intricate fine-line designs, and he applied his signature style to this tattoo. 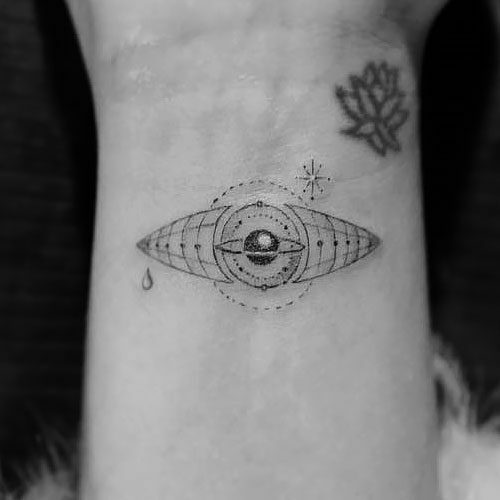 Katy had said a while ago that her Witness tattoo would likely be “some form of an eye,” and Dr Woo’s design is that, but there’s also a lot more going on in it. The pupil of the eye has a ring around it to look like a planet and the white parts of the eye are drawn with architectural curved lines through them. The whole design has a very outer space feel, looking almost like a spaceship or a satellite, which is reinforced by the twinkling star above it. But the eye also has a little teardrop in the corner. Katy chose an eye for her tour tattoo since eyes have been the most prominent symbol of her Witness era. The album cover features Katy with an eye in her mouth and eye motifs have been used for her stage backdrops and costumes. The elongated eye shape of her tattoo, with the whites separated from the iris, is copied directly from the eye-shaped video screens behind the stage. 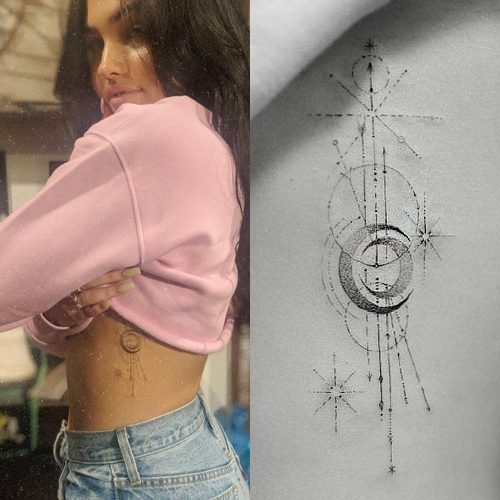 The Saturn-like planet in her tattoo is also inspired by the tour’s stage art. Katy performed the song “Thinking of You” each night while flying through the air on top of a planet. 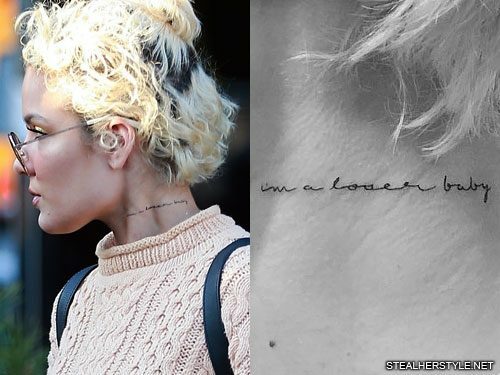 Halsey has the lyrics “i’m a loser baby” tattooed along the left side of her neck in delicate cursive writing. This phrase was made famous by alternative singer-songwriter Beck’s 1993 hit song “Loser,” however these lyrics are also used in the 2017 song “Loser Baby” by indie band La Bouquet. 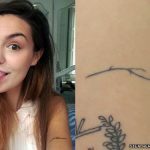 She is a fan of both artists but has more of a personal relationship with La Bouquet and has actually tweeted about their song, which is more likely the direct inspiration for the tattoo. La Bouquet band member Bryan Sammis was one of the opening acts for Halsey’s American You(th) Tour with his solo project Olivver the Kid. Halsey’s tattoo was done by artist Jon Boy at Bang Bang Tattoos in New York City in January 2017. She was accompanied by her boyfriend G-Eazy for the second time. He got an angel and devil on his arms which Halsey drew for him. 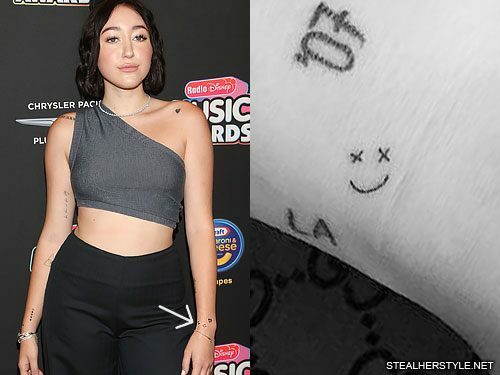 Noah Cyrus got this tiny smiley face with x’s for eyes tattooed on the back of the wrist from artist Jon Boy in June 2018. She took the gun herself and tattooed the same design on the artist. 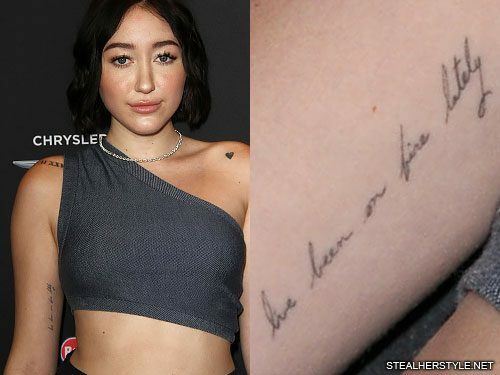 Noah Cyrus has some of her own lyrics tattooed on her bicep. 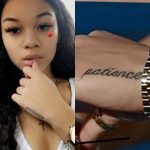 The cursive ink on her inner right arm says “I’ve been on fire lately” which comes from the chorus of her song “Lately” featuring her boyfriend Tanner Alexander.